Wondering what’s the latest in social media? Four words: live streaming video apps. Here’s a breakdown of what they are, the big players and what this means for small business owners and entrepreneurs. Like the name suggests, live streaming video apps are apps that allow for live streaming of pretty much whatever is in front of your camera. No video editing, no shooting multiple scenes or broadcasters bleeping out the swear words, it’s all live content streaming directly to a users followers. Most apps also allow for followers to comment and share how they feel about the video they’re watching. The idea is to share an experience, so some apps won’t save the video permanently after the broadcast is finished. The biggest players in the live streaming video app world right now are Meerkat and Periscope. Both apps heavily – and almost exclusively – rely on Twitter (Periscope being owned by Twitter), and are in app battle for the top spot. It seemed easy at first for Periscope to take the title, since after they were bought out Twitter announced that they would cut Meerkat’s access to the platform’s social graph. Many experts predicted Meerkat’s death, but instead the app’s developers and users found a way to dodge being crapped on by Twitter. In two months, Meerkat grew from 0 to 700,000 users, and has kept growing even after the bird drama. Not to be outdone, Periscope reportedly had 1 million users sign up in its first ten days. And in its fight to top Meerkat, the folks behind Periscope have been working furiously to make improvements and innovate. One of the key changes they announced in May was Periscope allowing people to sign up and use the platform outside of Twitter. Now if you want to use the platform with a Twitter account, Periscope will make recommendations based on your current followers. 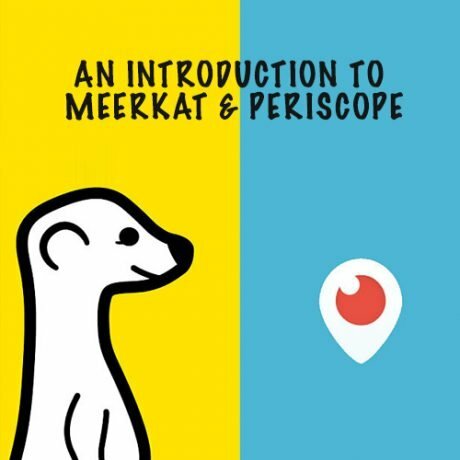 Meerkat and Periscope are relatively new in the broader social media landscape. But the idea isn’t new – live streaming apps have been available on Facebook, YouTube and Google+ for a while. And yet every week it seems there’s a new live video streaming platform released — including current major platforms releasing their own apps. If you’ve already made your way onto Periscope or Meerkat, you’re officially an early adopter. But if you’re trying to figure out what this means for you and what the opportunities are, read on. 1. Where’s your audience? Not everyone has heard about Meerkat and Periscope, but if you have audience members who have signed up to either platform or you get the impression that they might be interested in live streaming video apps (maybe the phrase pop up in a post or conversation), that’s something to take notice of. 2. Where are your competitors? Creep your competitors’ social media profiles to see if they’ve ever hosted a broadcast. 3. What would you do? Imagine you were signed up to a live streaming video app and some of your customers were following you – what would you use the platform for? What would your followers see? Does it fit with your current plan? Think about what you have planned for your social media marketing – does live streaming video fit in? And if it does, how would it fit in? This entry was posted in Online Marketing and tagged Meerkat,Online Marketing,Periscope,Video on June 15, 2015 by ReferLinks Online Marketing.